Sunrise Centers has been serving Seattle and the Greater Seattle area for over thirty years. 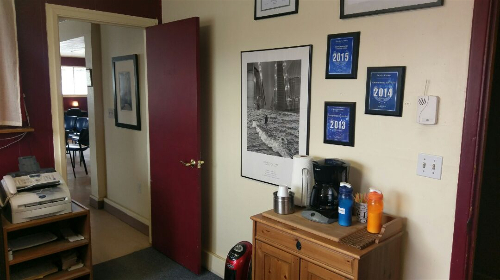 As one of the earliest outpatient treatment centers in Washington State, we have a lengthy history of working to make a difference in the lives of our clients. It's our privilege to help where we can. As a relatively small agency, we strive to keep a warm, friendly, and personable approach, where every client feels the benefit of individualized care, whether it's for an assessment, or for a two year Deferred Prosecution program. Even our building (which has the look and feel of a residential home) lends to our approachable model of client advocacy and support. We may not be fancy, and we're fallible in our humanity, but we seek always to give our best for each and every person we serve. It is difficult to try to provide, on this website, an answer for the many financial questions that arise. However, in general, regarding insurance, we do work with insurance companies who work with us. Benefits would depend on the individual insurance plan. The best course of action is to contact our Financial Manager, through our office number, (206) 248-3006, and request a review of benefits. After signing a Release of Information with us, your insurance company will be contacted, to verify what benefits are available, and our Financial Manager will propose a financial plan, based on the information provided from your insurer regarding deductibles, co-pays, percentages of coverage, etc. In most cases, due to the insurance billing process, we set up a regular payment plan, and simply reimburse you for everything your insurance plan covers. Other questions are, do we have an official "sliding fee" scale, and do we participate in any state funded programming. The short answer to both of those questions is a no, but the long answer is that, once again, we handle all cases and all requests on an individual basis. Our ability to offer discounted or scholarship programs is very limited, simply due to our own financial constraints. However, just as we know, first hand, the difficulties of these very challenging economic times, we also understand that many in our communities are experiencing similar, or greater, financial hardships, and certainly we strive always to maintain an open ear and willing heart to do what is possible, to the best of our ability. Again, contacting our Financial Manager is the first step. Outline your situation, and let us see what we can do to help. Sunrise Centers is conveniently located near to a variety of major travel ways, with easy access from Interstate 5, Highway 518 and Highway 509, utilizing main routes nearby the Southcenter Mall and the SeaTac Airport, routing over to Burien Our general area of location is just across the southern boundary of Seattle, inside the Burien city limits. Once reaching 1st Avenue South, in Burien, we are just off the intersection of 1st Avenue South and 128th Street, across from a Safeway, and next to a 76 Gas Station. If parking is full, up front, please park in our back lot. Access is through the front main door, noted by our "Welcome" sign. Please stop by anytime and check us out, have a cup of coffee, and ask any questions you might have. For an assessment or for discussion of treatment options or treatment transfer from another agency, it is best to call, or stop in, and set a specific appointment time, so that we have ample time to answer your questions in full. If referred by an attorney for an assessment, be sure to ask if your attorney is in our referral network. Clients referred by attorneys in our network receive a $30 discount on assessment costs.